Markings are usually from a cigarette or iron, if kept too long on the fabric. Even the most experienced hostess are not immune from this trouble. And, unfortunately, suffer most often those things that are most popular. If podpaliny light yellow color, you can try to save your favorite clothes. Before you remove the markings clean the entire thing, clothes brush. Then dampen the cloth around the stain with warm water. It will protect your thing from halo, which is very difficult to remove after cleaning. Dissolve borax in 600 ml of warm water. This solution will help to remove markings with cotton and linen fabrics. Wipe the stain with a clean cloth under running cold water. Then soak in a borax solution and gently RUB until the stain is gone. After processing, thoroughly rinse the thing in warm water. White linen and cotton things can be saved, leaving overnight in a solution of water and sour milk. By morning, the light spots will disappear. Markings with fine silk cleaning using a slurry of water and baking soda. Apply paste to stain and leave until dry. Thing then rinse in cool water. Light scorch marks from an iron or the cigarette can be removed with sliced onions. Just wipe the stain with a half of an onion, until the disappearance of spots, and then wash it spoiled thing with any means for delicates. But be careful when handling dyed the things they can change its color under the influence of onion juice. If you hurt thing can not be washed, for example, expensive silk scarf, you can use the glycerin solution. Dilute glycerin in warm water in proportion 1:1 and leave on the fabric for two hours. Then clean off with a sponge dampened with warm water. Padalino from cigarettes on the carpet, you can remove fine-grained sandpaper. RUB the stain in a circular motion until the stain will not come off. Often even very experienced owner can leave a stain of iron on the clothes. Do not just get upset and throw it at the first sight is permanently damaged thing. You can try to fix the situation with the help of folk remedies. To remove Padalino from iron from clothing, moisten the tainted place with a little lemon juice, apply on top of the icing sugar, leave to dry and then wash the thing in cool water. 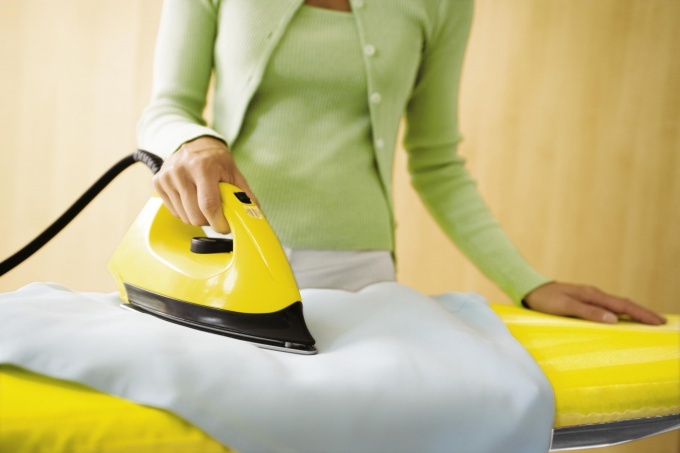 To get rid of stains of iron, moisten them with water, then sprinkle the food with salt and allow to dry. Thing rinse in cool water. 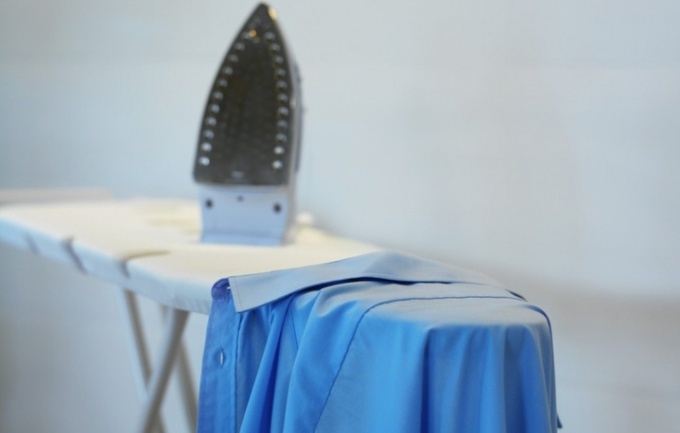 You can still remove Padalino from iron with garment by applying to the stain of hydrogen peroxide. To give and to dry and rinse in cool water. To remove stains from the iron, take cut into 2 parts onion and wipe podpaliny. Then wash the thing with the use of washing powder. To remove stains from iron with cotton and linen fabric dissolve 1 teaspoon borax in 1 Cup water. Wipe the stain with this line-up and wash.
To remove stains from iron with silk prepare a lot of baking soda and water. Apply the paste to the stain and allow to dry. These tools can save your thing only if the material remained intact, and the stain of iron is yellow, and not brown. If you failed to remove stains from the iron on the clothes, contact to the dry cleaners, be sure to warn employees of an independent attempt to get the stain out. The scorch marks from iron – that can be offensive? Pat's favorite white blouse or bright skirts, and then... got Distracted for a minute. Came back and the light fabric yellow podpaliny. Yellow? Well, well... It's not so bad, you can try to get this spot and save the thing. Preparations for the removal of stains. Any product before cleaning, be sure to treat with the vacuum, then brush. Dampen the cloth with water. Because of this, you protect the fabric from the formation of streaks, which is very difficult to remove. Check the colour of the fabric. RUB the prepared solution of fabric in an inconspicuous place, or on the inside of clothing. 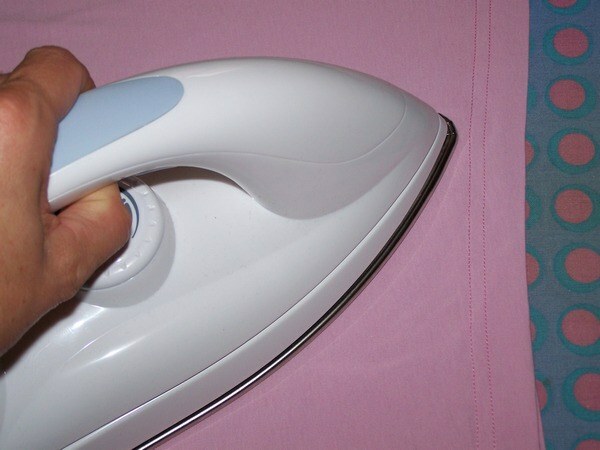 A very simple way to restore the whiteness of your clothes, singed iron. Dilute sour milk in half with water. Soak the prepared thing in this mixture and leave overnight. In the morning rinse thoroughly. Helps to remove light stains hydrogen peroxide. Just dilute the peroxide with half water and wipe podpaliny. Hang the clothes in the sun. After drying, clean the area where the stain brush. Finally, rinse thoroughly in cold water. The peroxide and ammonia to help clean the plain things. Colored clothes will save the borax solution. Simply wet the stain with the solution, RUB it and then wash with a mild detergent. To save white linen and cotton fabrics, you can use bleach. Dissolve 1 tsp lime in a glass of water. Save the item is pre-wet. Wipe the stain with a solution until then, until it disappears. But this method is not suitable for the undyed wool. Knitwear from undyed wool yarn wash with solution of 3% hydrogen peroxide and 5% ammonia, mixed in equal parts. Then dry with a warm iron. Probably every woman at least once in life, during Ironing the iron, would leave markings on clothes. If the Laundry is not it burned through and left a yellow stain from the iron – so the thing is not ruined forever. There are a number of ways that will help to return your things again. But if the clothes remained a dark spot or a hole, thing have to say goodbye. If the silk fabric was formed stain of iron, it can be removed with soda. To do this, mix a small amount of baking soda with water to form the consistency of porridge. Resulting mixture to RUB the stain from the iron and leave the linen to dry completely. After that, a soda to gently clean off the clothes-brush, and the thing is to rinse in cool water. Markings on clothing can be removed with the bulbs. An onion cut in half and RUB the fabric with half of a raw onion. After onions RUB the stain with detergent or liquid soap. Soak the linen in cold water and an hour later, carefully RUB the stain with a brush for clothes. If the stain of iron formed on white cotton or linen fabric, will help you sour milk. To dissolve in a basin of sour milk with water in 1:1 ratio and soak the linen with tan, leave on overnight. Morning linen rinse in clean water, the stains will disappear without a trace. Apply a small amount of hydrogen peroxide on the stain from the iron and lay the garment in the sun. After drying, rinse the thing in the cool water. If the stain is from iron formed in the solid linen viscose silk, you will need denatured alcohol, which you need to RUB the stain. Then thoroughly rinse with cold water. Wet the damaged spot on linen with lemon juice, pour on top of powdered sugar. Leave until dry, then wash the thing in cold water. In water, add a little vinegar to moisten in acidified water cheesecloth a good squeeze and using it to iron singed the fabric. Many people are mistaken in thinking that to get rid of greasy stains on clothes can only professional dry cleaning. This is the most simple and easy method. But do not hurry. 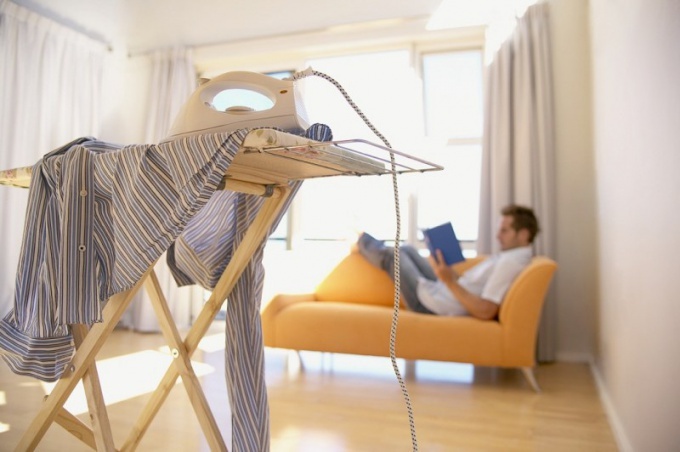 Get stains from clothing can be in the home. To remove fresh grease stains from light fabrics, it is necessary to sprinkle the contaminated area with chalk, or white clay, leave on for 3-4 hours and then wash the thing with powder. For removing greasy fresh spots with dark clothes must be ironed with a hot iron spot through the tissue paper up until the stain is gone. To remove old grease spots from wool clothing with the help of petrol or acetone. This requires a small amount of solvent applied to the stain and leave for 2 hours, and then ironed with a hot iron through the tissue paper until complete disappearance of the spots. Greasy stains from wool fabric, you can still remove if the drop on him 3-4 drops of alcohol, cover with a soft cloth and ironed to goracici iron. Grease stains from silk or fine wool fabric can be removed if immediately sprinkle them with talcum powder and leave for 10-12 hours. Then talc to shake, and the place where it was slick, ironed with a warm iron. To get rid of greasy stains on light silk can be moistened them with heated alcohol, and washed in warm water with detergent. To remove grease stains from clothes can be, if immediately sprinkle them with salt and dry, then sprinkle again. To do this up until the stain is gone. No less effective means to remove oil stains from clothing are commercially available special compounds – stain removers. Cleaning grease stains on clothing must be implemented from the edges to the centre of the stain, placing it on a soft cloth. To put on clothing or a tablecloth spot of grease in the household, this happens quite often. The culprits of such pollution can be not only animal and vegetable fats, some household items (e.g., candles and clay), but such insidious materials, like oil paint or linseed oil. It is necessary without postponing to wash greasy spots, otherwise then to put thing in order will be much harder. Try immediately after contamination to wash forspotgoes fat product in warm soapy water. While the stain is fresh, so you can remove even oil paint. However, the possibility of immediate washing is not always possible. Use any absorbent powder will absorb the grease of vegetable and animal origin with the surface of the fabric, if the contamination is not time to date. As the absorbent means you can take a choice of crushed chalk, potato starch, talc or baby powder, burnt magnesia, and even a red-hot river sand. Heat in a frying pan absorbent for better cleaning effect. Then pour the heated powder from the back and front sides of a dirty place, cover with 2-3 layers of paper with an absorbent surface of a blotter, napkin, toilet) and push something heavy. It is best to keep the press all night and in the morning a good shake the thing and thoroughly clean it with a linen brush. To clean greasy spots "hot pursuit" very good mixture of absorbent substances with any organic solvent. Take what is at hand: for example, acetone, white spirit, turpentine, purified benzine or chloroform. Mix liquid slurry of powder and solvent, and lubricate the spot. After 5-6 hours, wash the thing in warm soapy water. To remove new and old stains grease helps the first assistant housekeepers household ammonia. Put under the front part of the stained fabric folded clean cloth and wipe dirt from the inside with cotton wool soaked in ammonia. Then lightly wash the product in warm soapy water or iron, the former site of the contamination using absorbent paper layer. Be careful using solvents on the delicate tissues! Before cleaning, first test the product on an inconspicuous area of the product. You can use a less aggressive material on hand. For example, using well cleaned silk and virgin wool. Dissolve 200 g of dry powder in water to obtain a homogeneous slurry and pass it through a sieve in a bucket of warm water. In a few hours wash over thespotagain thing using prepared mustard infusion of three doses. Into the water to rinse hair, add 5 grams of ammonia, and silk things, the same of vinegar. Harder to bring dirt from oil paint, varnish, lacquer and resins. Old stainsleft by the finishing materials, it's best to lubricate with vaseline or interior fat to soften. You can also use warmed glycerin. After half an hour remove the body weight and take the spot from fat solvents, which you have at hand. Well proven mixture of chemicals such as benzene and acetone (1:1) or turpentine, ether and ethyl alcohol (2:1:10). To make things more attractive, after cleansing stains is recommended to wash it completely and thoroughly rinsed, first in cold, then in warm water. If you are often faced with the fatty stains, prepare for the future ready cleaning agent, which is popularly known as "petrol soap'. It must be dissolved in the gasoline (about cups) teaspoon of rubbing alcohol. The mix needs to be mixed and add a teaspoon of ammonia solution (25%). Store "liquid soap" along with other household chemicals in a tightly sealed bottle of opaque glass. 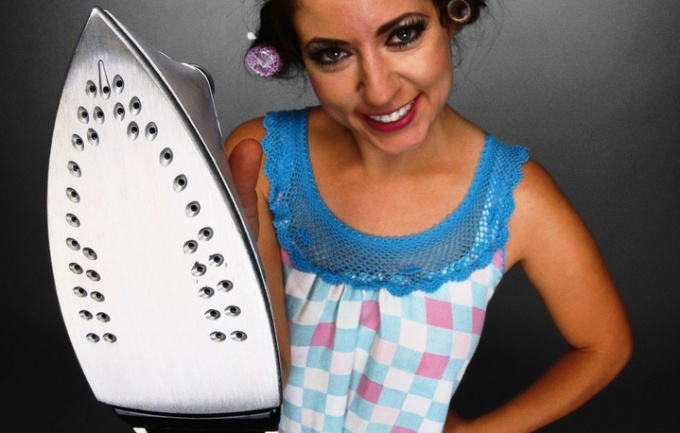 To leave a stain of iron on stuff manage even the most careful housewife. Yellow markings on clothing are formed usually due to incorrect mode of Ironing or negligence. The situation can be corrected, if it is not burnt through. The stain of iron on clothing can be removed using lemon juice and powdered sugar. Apply a scorched place the lemon juice, sprinkle with powdered sugar. Allow to dry. Wash clothing. Wet the stain from the iron in cold water, then sprinkle with fine table salt. Hang out to dry in the sun. When the clothing dries, rinse it in cold water. Use of hydrogen peroxide. Apply the product on the stain and leave to dry in the sun. Then rinse in cold water. Also get rid of the stains by using vinegar. They wipe the stain and iron very hot iron. To stroke should be through the fabric. If stains were formed on the linen fabric, use a solution of borax. In a glass of water, take 1 tsp. of borax and mix thoroughly. Apply on the stain, then rinse, dry and iron. Use onions. An onion cut in half, RUB the stain with a cut. Next, wipe Padalino detergent diluted in water. It is better to use liquid detergent for delicate fabrics. Rinse thing. Sometimes this procedure helps to change the color of the fabric. In this case, the spot should be wetted with vinegar diluted with water. Also the stains from the iron can be removed using hydrogen peroxide and ammonia. Components are mixed, is applied to the damaged place, after which the thing is dried and washed. If markings formed on the garment in viscose silk, use denatured alcohol. Stains on cotton fabric white color can be eliminated with the bleach solution. In a glass of water dissolve a few grams of lime and wipe the damaged areas. Next rinse. Original look white clothes made of cotton and flax can also be retrieved using sour milk. Dilute the milk with water in 1:1 ratio, soak in this thing. A few hours later from spots, as a rule, not a trace remains. 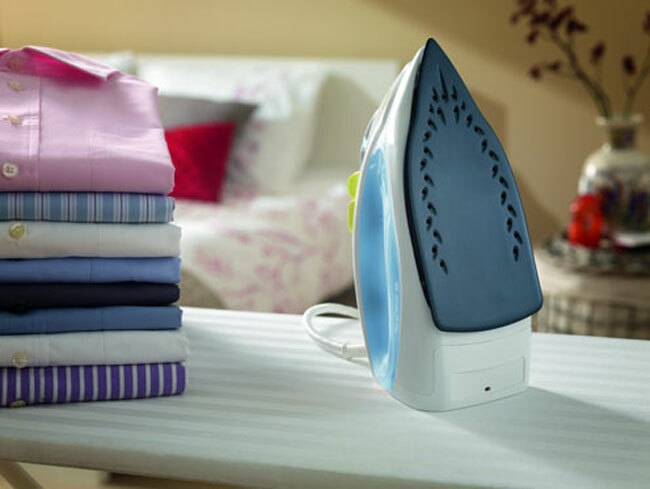 If when Ironing, you did not calculate the temperature of the iron and the fabric appeared smooth tracks – Lasy particular reasons for concern. Lasy can be removed with relatively simple actions. To avoid lasov, watch the temperature of the iron. It should match the fabric, which consists of the product. If smooth tracks are still there remove them is possible with woolen fabrics, but not synthetic. If damaged synthetic, sole remedy is to paint a tonal colored pencil of the right color. No folk remedies synthetic fabric will not be saved. With wool Lasy can be removed in the following manner: take a wet cloth or gauze and a piece of batting. Much soak the wadding with water, wrap in a cloth and turn on the iron. Slide the iron over the damaged tissue, otarova through a damp piece of cotton batting. To press not iron. Immediately after steaming, wipe the fabric with a damp cloth. If Lasy not very noticeable on the fabric, you can try to remove them just strong steam. Soviet method: RUB the tainted place the raw grated potatoes or finely chopped onions, and then wash. Used taken out of school spots with brown or blue form. Steaming can be carried out using a rag moistened with vinegar or citric acid. After Stripping, treat the damaged area with a soft brush. If the fabric has NAP, spend the first brush against the NAP on the trousers or skirt, then across it. Treat the damaged area of the fabric with hydrogen peroxide. This method does not give a perfect result, but it is still possible. White marks on the fabric can appear and due to too hard water. Therefore, in iron it is impossible to pour water from the tap, it is better to use boiled or distilled. This you will save from damage and iron, and clothes. If funds allow, you can purchase special iron to the invoice of the sole, then the trace on the fabric will be forgotten. Put a grease spot on clothing is very simple, but the withdrawal raises a lot of problems. If the stain is fresh, folk remedies and modern stain removers good help, but sometimes you can not see the traces of grease, which will eventually fade and become dull. But they can be addressed if you know a few effective techniques. Usually the grease spots are obscure, blurred contours and "rays" radiating out in different directions. Old stains manifest on the other side of the fabric. Turn the thing inside out and clean off dust with a damp brush. Put under matter white paper towel or cloth. Apply on cotton ball remedy for removing stains and soak the area around the track. Then gradually move from the edges to the center so the stain will not melt. Be especially careful with synthetic and coloured fabrics, better check the effect of stain remover on a spare piece of fabric. 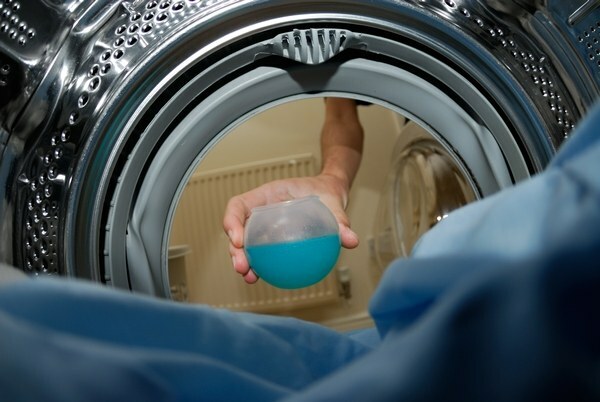 You can first dilute the agent with water so that concentrated solutions can damage clothes. Traces of vegetable oil, mayonnaise, oil paints, creams, resins well are printed using organic solvents – alcohol, turpentine, acetone, you need to apply them on a cotton swab and act in accordance with the first paragraph. Be careful, these tools can also ruin the fabric. You can also make a solution of ammonia salt (25 grams of alcohol and 5 of salt). Sprinkle the stain with salt and pour this mixture. Then RUB the bread or blotter. If traces remain, add the salt. For woollen fabrics suitable gasoline, with a velvet print grease stains with turpentine. Sprinkle the spot with chalk or talc, cover with blotting paper and iron. After that wash the thing. If the fabric cannot be washed in hot water (e.g. silk), take the heated potato flour, sprinkle her a trace of fat and shake off in twenty minutes. Repeat until the garment is clean, then remove the flour with a brush. Of potato flour, you can make porridge by adding hot water. Apply it on the old stain and leave to dry. To remove greasy marks from silk you can also use glycerin. Half spoon of ammonia, mix with a spoon of water and glycerin, soak the thing in this mixture for ten minutes and rinse. To remove greasy stains from the collar before washing RUB it with bar soap. On top of clothing collars wipe with cotton wool soaked in saline solution or ammonia. Before you use any tool for removing stains, try it on the hem or the margin of the fabric at the seam. If after Ironing the garment remained a bright spot, don't despair, in most cases it can be eliminated. The sooner you start treatment, the more chances you have to save the thing. Use tested recipes that have already helped many people keep their favourite things. Take a medium size onion, cut it into two halves or grate on grater (the output should be a fine paste). Apply the pulp on the spot or carefully grate the very spot half the onions, leave like this for 4-5 hours. Soak spoiled thing for half an hour in cold water. After some time wash it at the temperature recommended for the fabric type. This method is most often used to remove stains from colored clothes. If the stain is not very strong, soak the fabric in milk for a couple of hours. When away stains from the iron, carefully wash the thing. Milk must be fat-free. Wipe fresh stains with lemon juice. Use this method when you need to remove stains from white, colored or black things. For cleaning things made of natural fabrics (e.g. linen, cotton, etc.) prepare a special mix: a few drops of ammonia (10%) dilute 125 ml of cold water and add one teaspoon of hydrogen peroxide. Moisten a gauze or cotton pad with the mixture. Wipe the stain and leave for a few minutes soaked. Then rinse in cold water and iron again. Wipe the stain from a hot iron solution of boric acid. When the spot is colorless, wash the thing in warm water, using ordinary soap powder or (baby or business). In order to remove shiny spots with black things, soak a clean gauze in a weak solution of vinegar and put on them. Top iron a hot iron. Make a paste of water and salt and apply it on the stain on the silk. Wait until completely dry, then brush it. With viscose shiny stain rinse with plain water. Try to clean the stain, wash the soap thing, in some cases it helps. All used solutions try on the back seam, as they may discolor some types of fabric. Synthetic fabrics have high strength and fastness. Unlike natural fabrics, they do not shrink. When removing stains it is necessary to consider the properties of textiles, and the origin of contamination. 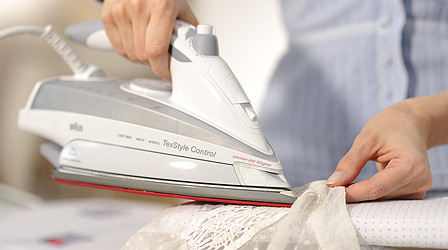 Fresh stains from fat are removed with a flat iron. Put the contaminated area several paper towels or blotting paper. Do the same with the right side of the fabric. Swipe the stain is not very hot iron. The fat will remain on paper. Wipe the stain with a cotton swab dipped in denatured alcohol. Then wash the product in warm soapy water and rinse under running water. Stains from vegetable oil, wipe with a cotton swab dipped in clean gasoline. It can be purchased at the hardware store. 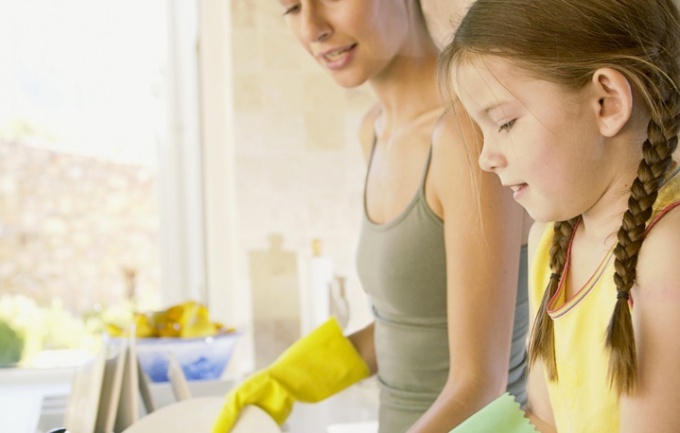 Wash the product in warm soapy water and rinse thoroughly under running water. Grease stain sprinkle tooth powder, cover with a paper towel and iron with a warm iron. This way you can quickly get rid of pollution. Stains from chocolate, cocoa and coffee are effectively removed by using ammonia. Blot the area of soiling and leave it for a while. Then wash the product in warm soapy water. Fresh stains from coffee sasteria in salted warm water and rinse in cold. Dirt drops do not immediately remove from clothing. Wait until it dries and brush. Clean stains with a weak solution of borax and rinse the product. Stains from lipstick can be removed using alcohol. Moisten a cotton swab in the liquid and DAB the soiled area. Stains from hair dyes are removed with a mixture of hydrogen peroxide and ammonia. Take 1 teaspoon solution per Cup of warm water. Moisten a cotton swab in the solution and blot the stain. Then wash the product in warm soapy water and rinse in running water. Before using any tool, test it on an inconspicuous area of the product. If the fabric did not change its properties, feel free to skip to the removal of stains. Careless Ironing or hot iron can form markings on things. Even experienced hostess such incidents happen but not to worry and to throw out spoiled thing. Actually you can remedy the situation by using folk methods, thereby removing markings from the clothes. But these tips are effective only if the material is not burned, but remained intact. Of course, if the material is a brown spot or a hole, in this case, didn't help. In order to remove the random markings from the surface of the clothing will need to moisten the tainted place with fresh lemon juice. On top, apply icing sugar and leave to dry. It remains only to extend the thing in cool water, the stain should disappear. Take of fresh bulb onion and cut it in half. Wipe out half the onions place markings on things. After that, wipe it with a solution of any liquid detergent. This can be liquid soap or liquid dishwashing. Thoroughly rinse the thing clean, cool water. But there is one drawback -- the color of the fabric after this treatment, can lose or change its color. It is possible to return if the wet stain with a weak solution of vinegar. You will be surprised, but the scorch marks from iron , you can remove even on silk fabrics. To do this, make a kind of mush them baking soda and purified water. Apply the prepared mixture on the scorched place, RUB gently and leave to dry. The remains of the soda will clean off with a soft brush. On linen and cotton fabrics, you can remove the markings with a solution of borax. Dissolve one teaspoon of borax in a glass of water, stir and apply the solution place markings on the clothes. Only need to wash the thing in warm soapy water. To clean with plain things the scorch marks from iron, it is necessary to moisten it with hydrogen peroxide, in which you want to add a few drops of ammonia. Then hang the product on the sunlight – balcony or loggia. If this problem affected the woolen fabric, then you need to first remove the stain by removing the top of the burnt particles. Lay the thing on a flat surface and gently satirise the stain with a damp cloth. If the cloth turns yellow, and the stain becomes lighter – continue with the experiment. Small markings often can get in this way. No need to RUB hard to avoid damaging the fibres. If clothing was formed from traces of iron, do not hurry to part with it. In most cases, such contamination is amenable to excretion. You can bring clothes in order using simple tools. Chlorinated lime, onion, borax, yogurt, hydrogen peroxide, ammonia, lemon juice, powdered sugar, newspaper. Use bleach to remove traces of iron from cotton fabrics. Mix 1 teaspoon to a glass of water. Then moisten a cotton pad and carefully apply on the damaged area of the garment. Rinse the cloth in running water and wash as usual. Peel the onion and grate on a coarse grater. Apply the resulting slurry on pollution and massage in a circular motion. If the fabric is badly damaged, leave the onions for a few hours. Then wash the trace of the stain under running water and wash it. This method is ideal for cleaning colored fabrics, except silk. Prepare a weak solution of borax. To do this, stir in a glass of water 1 tsp funds. Soak a cotton pad in the liquid and DAB the stain from the iron. Leave for a few hours. After rinse and wash clothing in warm soapy water. Remove traces of iron from the linen fabrics in the following way. Pour into the bowl with the yogurt and water, taken in equal proportions. Soak the tainted garment in the solution and leave overnight. After this time rinse the thing and wash it. Instead of yogurt can use sour milk. It also creates a slightly acidic environment, which helps to eliminate the tan. Mix 3% hydrogen peroxide and ammonia in the ratio of 1:1. Then carefully apply a tainted place clothes with a cotton swab dipped in the solution. Leave the fabric to dry completely. Wash clothing with detergent for stubborn stains. Apply on the damaged area of the clothing with lemon juice and sprinkle with powdered sugar. When the fabric is completely dry, remove it on the wrong side. Rinse the trace of the stain under running water and wash it. Put clothes on the Ironing Board. Cover the contaminated area with paper and iron a warm iron. Repeat a few times. Be extremely careful, a typographical paint can leave unpleasant traces and even more will ruin the fabric.